Hundreds of new and updated photos and sketches highlight this new edition with the most compact, accurate, and up-to-date content in the market! 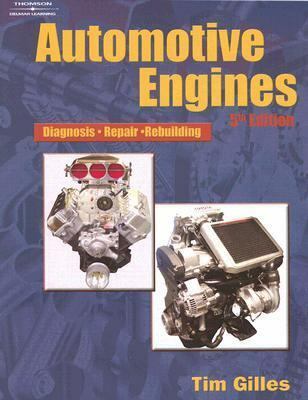 The Fifth Edition of Automotive Engines addresses current industry trends and concerns while providing comprehensive coverage to build readers technical expertise and critical thinking skills. Revision highlights include an enhanced engine diagnosis chapter and updated information on four-valve-per-cylinder engines, camshaft timing, variable valve timing, and high performance engines. Finally, hundreds of new and updated illustrations bring this new edition to life!Gilles, Tim is the author of 'Automotive Engines Diagnosis, Repair, Rebuilding', published 2006 under ISBN 9781418009632 and ISBN 1418009636. Loading marketplace prices 7 copies from $51.56 How does the rental process work?